KoopaTV: Were We Right About the Miiverse Summer Redesign? By LUDWIG VON KOOPA - I wrote what the ramifications would be. Did those play out over time? On July 29th, 2015, I published Ramifications of Miiverse Redesign Summer 2015. It was a great, detailed article outlining each of the changes that happened with Nintendo's summer 2015 Miiverse redesign that dramatically affected Miiverse, and presented my thoughts about how each of those changes would change Miiverse usage and activity. It was published the day the redesign took into effect. Changing one stream of posts in a community to four (Play Journal, Drawings, Discussions, In-Game Posts) would make things more difficult to find, less fun, and it's over-organised. The best place to make posts is the Drawing section. 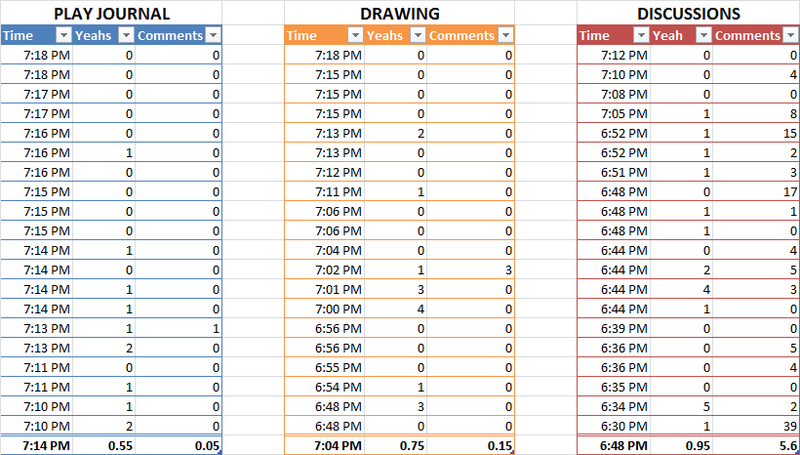 Replacing the Activity Feed with the Play Journal would result in a loss of entertainment. The 30 posts+comments per day policy is stupid, and reduces the total new daily quantity of content on Miiverse. Courtesy and good manners will be reduced on Miiverse. Community and close-bonding will be discouraged. People will be scared away from Miiverse. 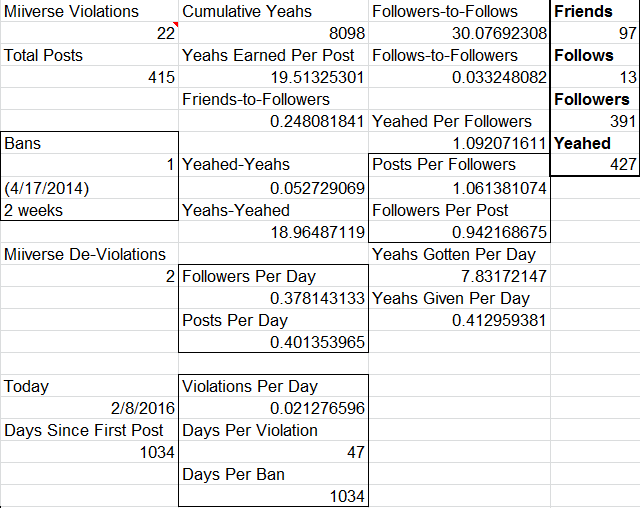 I can't empirically prove that all of these things actually happened, but I also can't prove they did not happen. Even if I went and counted the amount of activity in a given period of time pre-redesign and post-redesign within the same community, that analysis would be grossly misrepresentative and not take many factors into account, like more people buying 3DSs and Wii Us. 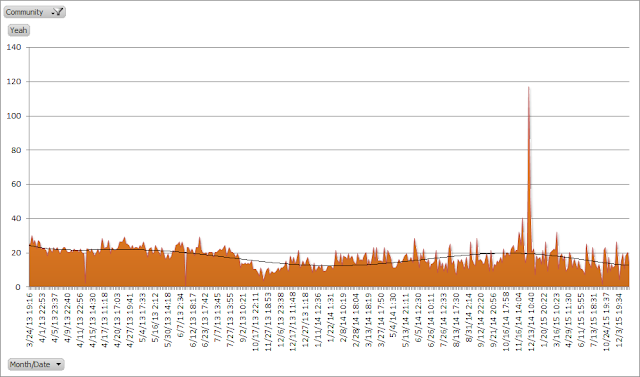 I can speak for myself, and note my metrics are mixed compared to when you saw them half a year ago. 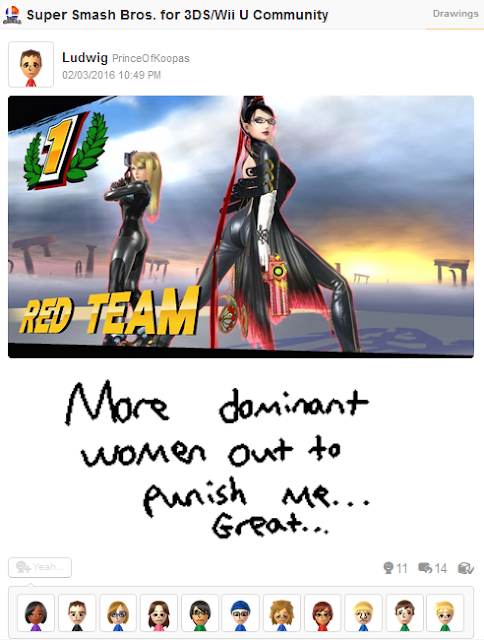 Only one additional Miiverse violation in that timespan! We know there was a shift in which communities got activity — the New Super Luigi U community did not exist as it does today pre-redesign and is always active. To get that, there had to be activity taken away from other communities. The very fact that this is a zero-sum game in a post-redesign world is indicative of the fact that content HAS to be less than before, because it wasn't a zero-sum game before. Before the redesign, if one community gets activity, it did NOT take away activity from another community. 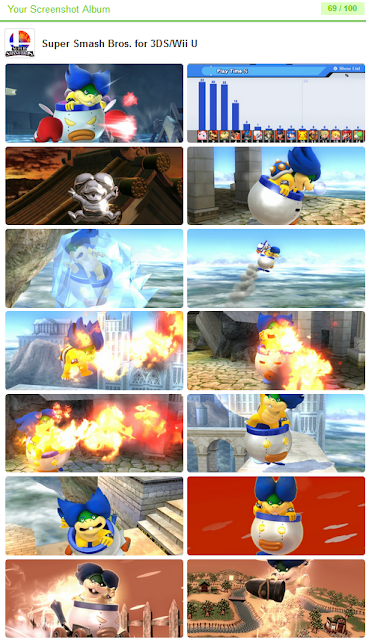 Both communities (though there are several hundred on Miiverse, and you can see most are dead) could prosper. From a logical perspective, my ramifications make sense. I still strongly believe the best place to make posts is the Drawing section — all my posts post-redesign have strictly been Drawing or In-Game only. It grants the most flexibility for poster and commenters, and doesn't come with the Discussion downside that the post can be closed for comments before the comment limit is even reached. Not everyone has necessarily caught on to that, however. Do people visit each of the three-to-four sections of a community in equal amounts? This is something that actually can be supported empirically, though I must warn that there are a lot of factors that go into this so it might not be the best idea! Doing it anyway. 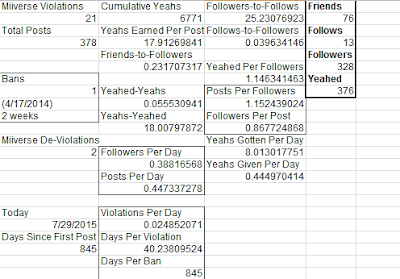 The last row in bold are averages. As of November 4, 2017, this kid still has 0 Yeahs and 0 comments on his scribble. 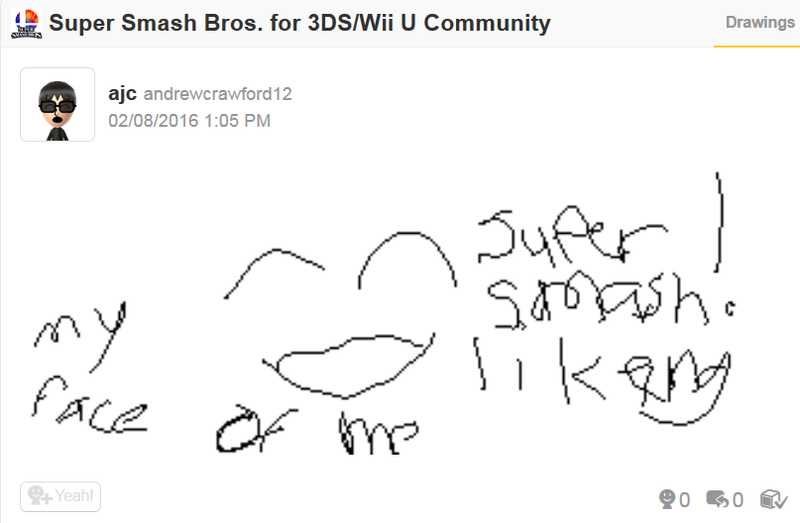 Miiverse will shut down before he gets any. Now in the evening. Same table set-up. We can see material differences in the community sections. Discussions are significantly more likely to get comments. Drawings get slightly more Yeahs, though in the evening, Discussions do. Play Journals are significantly more cluttered and filled with more stuff than the other sections (they get significantly more posts per time unit than the other sections). The reason for this likely has to do with the fact that when you access Miiverse while a game is running on your system, it prompts you to the Play Journal section. You have to go out of your way for the other sections, and it seems that people are more likely to access Miiverse while playing a game than accessing Miiverse for the sake of going on Miiverse. I don't know if most of the people who use the Play Journal even know that Miiverse has other sections, like how most people who post In-Game things on Miiverse don't know Miiverse is something you can freely browse. This suggests that the Play Journal functions as a dumping ground, while legitimate users of Miiverse use the other sections. They are not visited at the same rate, and why should they be? Nintendo arbitrarily separated sections of the community that take multiple clicks to access. People would rather click once and see all the content available. I know I think of Miiverse as a game, but it's silly that a social network — one that really is more analogous to a forum than a social network — requires its people to strategically think of where to post to get exposure and be able to talk to people. Chances are, if you posted in the Activity Feed before the redesign, you knew how Miiverse worked. You had to go out of your way to access it, and you could reap the benefits of screenshots from any game. 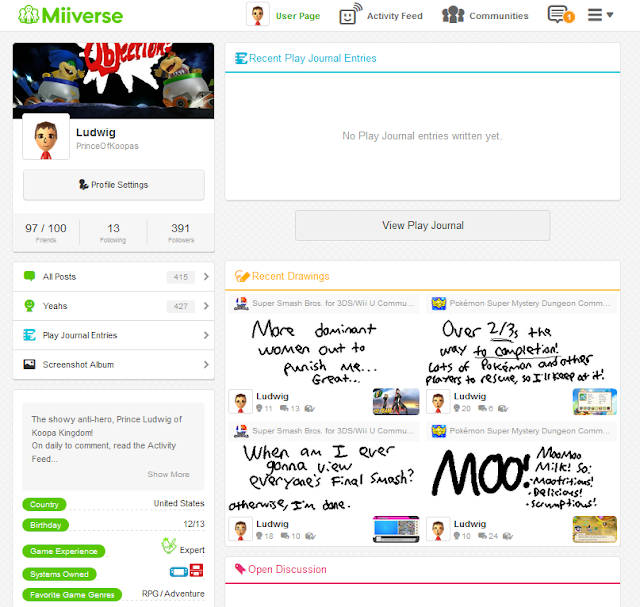 Chances are, if you use the Play Journal now, you don't know how Miiverse works. I can't prove that courtesy on Miiverse got reduced over time, but I can demonstrate the lack of it. I wrote an article last month stating that of the many rescue requests I've done in Pokémon Super Mystery Dungeon, there is an unfortunate lack of Thank-You Mail or even thank you comments. Why is that? Do people not want to use their posts for the day? Do they post the rescue request in the Play Journal and then never come back to Miiverse because they think they'll get some sort of in-game notification? Regardless, the redesign can be traced back to all of these problems. There were a few updates since the redesign occurred July 29, 2015. These have made Miiverse better, and have improved the redesign. Through the August 19, 2015 and November 11, 2015 Miiverse updates, people could use images saved in the Screenshot Album in posts and comments for any of that community's sections. While we don't have the luxury of posting, say, the OBJECTION! from Phoenix Wright: Ace Attorney in any community we want, sticking to a few communities to do most of your conversations pays off. For me, that would be Super Smash Bros. 4's community and sub-communities. I have a picture of myself for any situation. It comes in handy, mostly for the Support Bowser Jr.! sub-community. These updates fixed my initial complaint when the Screenshot Album was introduced. Good. It makes it a very valuable addition. ...Perhaps the only value-added addition, but still. Poor guy who spent a dollar. We know how he must feel to spend at the badge casino. Meanwhile, the advertisement features PredictIt, a political outcome betting site. Politics are also banned on the Code of Conduct. I personally don't have any issue with advertisements on Miiverse. Those are probably there because the marketing guys couldn't justify the word-of-mouth effects of Miiverse to the budget guys. 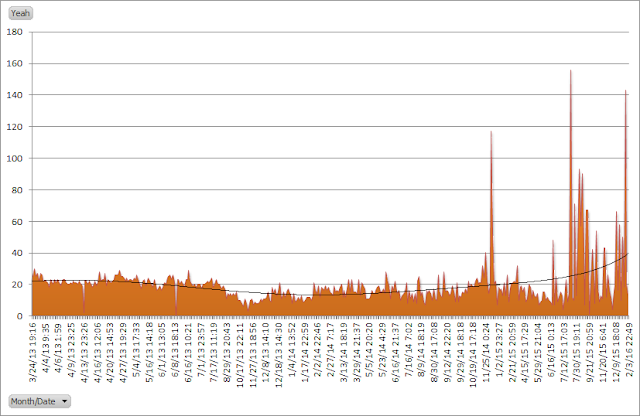 You know, it'd help word-of-mouth if people could make as many posts as they wanted in a day! This update happened October 14, 2015. To help the word-of-mouth effect out, Nintendo officially took over the YouTube community as the domain of Verified User Skye, who posts videos (commercials) from Nintendo's YouTube channel. The YouTube community from before still exists, it's just broken up by region now, and the url changed, so old posts on the old YouTube community are locked out of comments. I don't really care about this update, but I know some people did and think it's a negative. Personally, I have the setting on that shows only English-language posts, which basically is a region-lock. I don't want to see unintelligible crap from Japan or gobbledygook from France when I browse Miiverse posts. Or even worse, Quebec. Don't share those NNIDs or friend codes! You cannot exchange publicly available NNIDs. This is an absurd prohibition, because all you have to do is go to someone's profile and their Nintendo Network ID is provided literally right there. Additionally, the Nintendo Network ID of the opening poster of a post is available as well, on that post. Right there. "PrinceOfKoopas" is my NNID. Above is the post where the screenshots from the welcome Bayonetta article come from. The best way to get Miiverse attention now, ironically, is via Splatoon In-Game posts. While those are accessible within Miiverse, I feel like no one looks at them through that and only through playing Splatoon. After all, posts generated while playing don't seem to be moderated, since the posts for Ludwig's Clockwork Castle in New Super Mario Bros. U are mostly just people swearing. Not being moderated implies no one looks at them on Miiverse, since you can't report while playing the game. Note what happens at 7/30/15 and on. No Splatoon posts. That outlier is my Miiverse profile picture, which has been advertised for over a year now. You can't make it on Miiverse just by using Miiverse. The problems of how hard it is to be popular, and how hard it is to stand out and be heard by anyone, is only exasperated by the Miiverse redesign of July 2015. You'll have to be content with being a nobody. 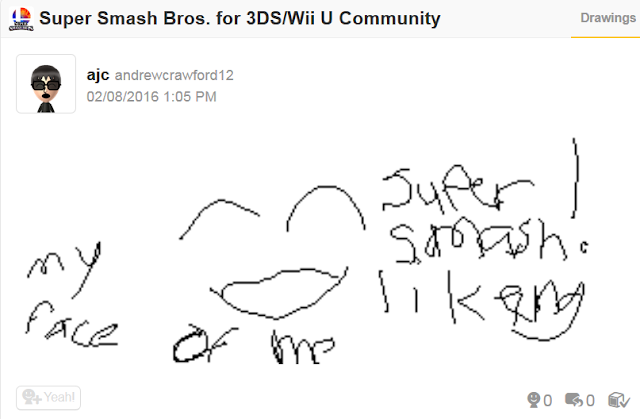 If you're fine with that, then Miiverse is the place for you. The redesign from 2015 only helped that. 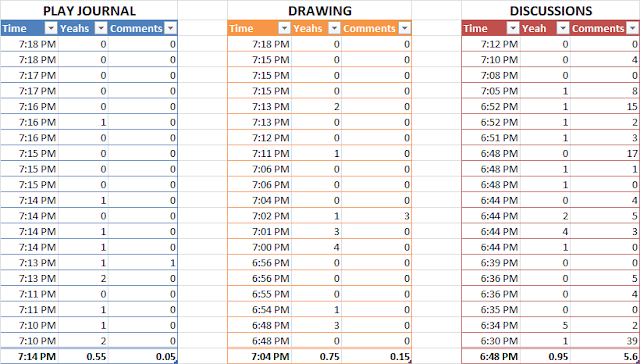 In case you haven't gotten the memo, Ludwig tracks his Miiverse activities in Excel because he believes it's a game. It seems to be a game he's pretty bad at, but he's close to 400 followers. So Follow him at NNID PrinceOfKoopas! He enjoys the fact that he can make predictions and they all come true. Want more Excel charts? Look here for their usage analysing Splatfests! This redesign reduced activity to the point where there was no point in having Miiverse anymore, so Nintendo announced that Miiverse will be discontinued. I used the journal section, drawing section and the discussion section so my page will be filled and not look so empty. My discussion question is planned to always have that single AW2 Green Earth characters' theme naming did you know question and to never be closed. I don't mind using the journal section because I don't like my handwriting so much. I have been told how much it is hard to read in real life. During Splatfests, if I am not sure what team I will be on yet but have ideas for what drawings I want to make for a team, I will use the drawing section instead. I believe Splatfest themed in-game posts take priority over regular in-game Splatfest posts so I just will go to drawings instead. I suppose if I ever do have one Journal Entry and one Discussion post, then it'll always be on my profile and be sort of perma-floated. I dunno what could be worth floating like that, though. If you look at my handwriting back when I first started Miiverse and compare it to now, you'll see it's gotten better and better. I don't think that's a coincidence! Yeah, Splatfest-themed posts would take priority. I think. It's an Advance Wars related post. Of course it will never reach 100. Unless you plan on spamming it just to prove me wrong. I don't plan to. I only can comment 30 times a day, after all. Unless you have some extra comments you did not use for the day and want to spare a few to post every day until it reaches 100. But since we already know I could do it in theory, there ain't a point in doing it in practise. I really only use it to sometimes check drawings, because some people really make amazing stuff on there, as for the browser version, I honestly preffered the older layout too .-. You're on Miiverse? Well, go Follow me. I actually disagree with the notion that Google+ is better. Even though Miiverse is organisationally a mess and has gone downhill, that doesn't mean Google+ is any better. Google+ recently had a redesign as well, though you can revert back to the older layout (which is what I do every time I access it). 3.sharing friend codes and NNIDs wont get deleted... I swear I nevee understood this.... the point of FCs abd NNIDs is to share them... right? It only says that in the article in four places. The fact there are a lot of #1 going on isn't Miiverse's fault, just the people who use it. Miiverse is a lot more organised, especially since the Activity Feed is ordered chronologically and not algorithimically. The restriction for NNIDs doesn't make any sense at all because those are publicly available on any Miiverse profile. So you don't even have to put yourself in a position to break that rule. 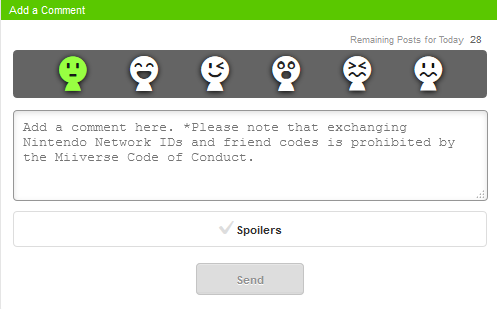 Not being able to share Friend Codes is likely a holdover from Nintendo of America's Nintendo NSider Forums (2003-2007) policies where you couldn't do that when the DS came out. People got around it by doing things like sharing their MKDS friend codes in unmoderated private messages, and Wii U owners do that as well with Miiverse PMs. It's relatively easy, though prohibited, to subtle-y lead someone off Miiverse and onto another site where your information is. I intentionally have PrinceOfKoopas as my NNID, since it's the same name for things like my YouTube channel and my DeviantART. It's a non-intuitive mess, ain't it? And it was better before, wasn't it?